My bank will only let me download transactions from the last 6 months but I need to do a reconciliation for 12 months. Can I cut and paste the additional 6 months entries into the .out file and upload them all? Also when I try to upload the 6 months .out file I get an “invalid header” error. You have some information in the column that shouldn’t be there. Select all the rows around the data and delete them. Sometime transparent information gets copied. Yep you can copy the data and import it. 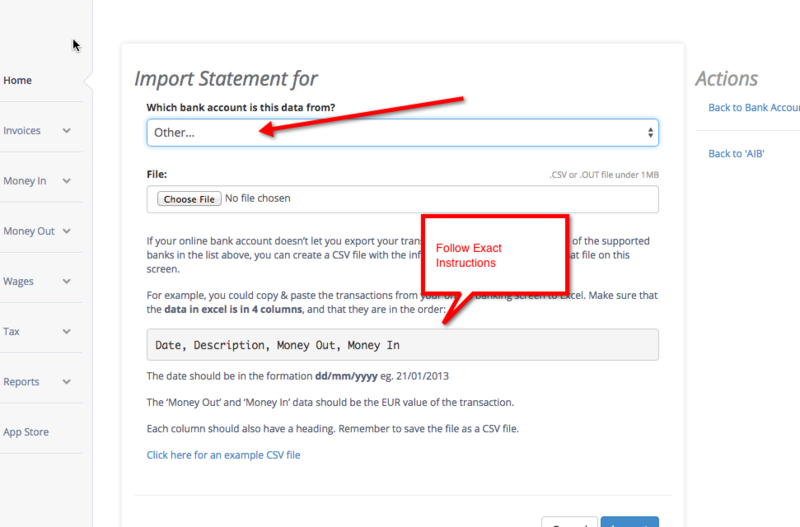 You have to follow our instructions exactly and copy the information into the spreadsheet we give you. (This has the same headers as the above issue should have). 30Hi folks, when I copy an AIB Visa statement from IBB and paste into excel for upload it’s putting spaces at the start of every cell.which causes the upload to fail. Is there an easy work around this other than having to go into every cell individually and remove the space? Many thanks, Sonya153Modify Chart Of Accounts Using The Accounting API100Hi John, any idea why there is no P60 for 2014 showing for me in my accounts? Shane142How To Track Projects In Bullet Free Online Accounting Software33Hi Pete, Can we connect our bank account to Bullet? I went to Bank A/S’s section and press connect online. It took me to the dashboard on Bullet.